TESTED TO MEET YOUR TOUGH HAULING DEMANDS. The patented EZ FlowXR Hydraulic Trap™ has been thoroughly tested to meet your tough hauling demands. From the field to the road there is no hydraulic trap that compares to the EZ FlowXR. 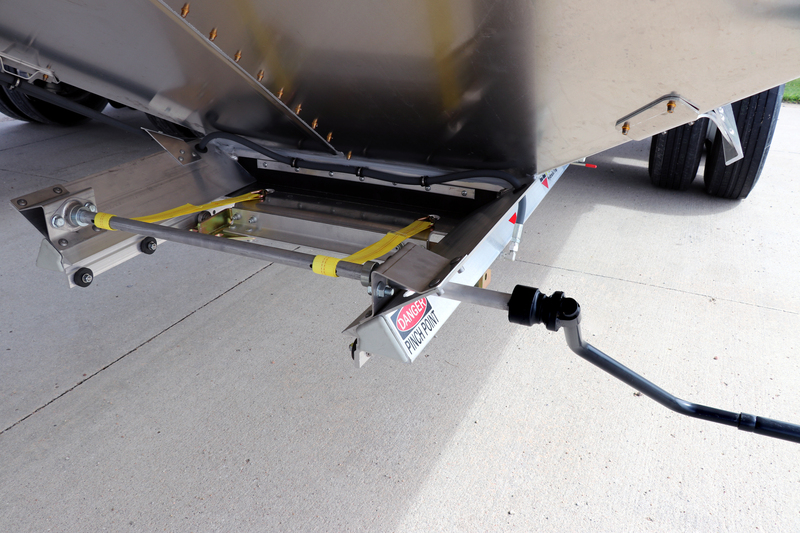 The EZ FlowXR Hydraulic Trap™ operates using a single 12-volt hydraulic motor that is safely located in the apex of the trailer. From the hydraulic motor, fluid passes through nylon protected hydraulic hoses and stainless steel fittings to reach the cylinders. When powered the trap can open in 15 seconds and close in 11 seconds making it one of the quickest traps available on the market. Operating the trap system is as easy as pushing a button. The operator can stay out of the dust by opening and closing the trap from the cab of the truck using the multi-function remote (included). However, if using the remote is not available you can open and close the trap by using the moisture resistant control box. The EZ FlowXR Hydraulic Trap has the industries BEST swing clearance, which makes unloading at the bin site fast and effortless. There are no manual operators or motors to interfere with the swing auger leg. With the increase in clearance positioning, the swing auger is a snap. The operator can stay out of the dust by opening the traps from the cab of the truck, using the multi-function remote. In the event of an emergency due to electrical or mechanical issues the EZ FlowXR doors can be easily converted into manual operation. The emergency manual override utilizes quick release pins and straps to open the door. This new override system is not only easy to use, but provides additional ground clearance compared to previous override systems.